It's only partially true that Sam Reinhart has been playing hockey since the day he was born. "My parents always joke the day I came out of the hospital and went home after I was born, they [older brothers Max and Griffin] had me in our playroom upstairs shooting tennis balls at me," he told NHL.com. "I'm not sure what day, but it was shortly after [he came home]," Paul Reinhart, a former NHL player and father of the three boys, told NHL.com. "He [Sam] was still in his car seat when they carried him up there. I'm not sure if it was the day after, but it was early in his life. He got a taste for it, for sure." When it comes to hockey, the game is part of the family DNA. Paul Reinhart played 11 seasons in the NHL with the Atlanta/Calgary Flames and Vancouver Canucks. His oldest son Max is a forward with the Calgary Flames and middle son Griffin is a defenseman with the New York Islanders. "Most days of the year … you're definitely on the ice," Sam said. "You try to take some time off at the end of each year, relax, take some time away from the rink. Throughout the years, though, most days you're on the ice." 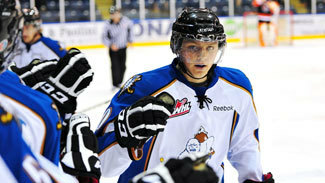 Reinhart has put his time on the ice to good use, as the center is a favorite to be the top pick of the 2014 NHL Draft. "He has a complete game at both ends of the ice," NHL Central Scouting's Peter Sullivan told NHL.com. "He does everything well. He won't get you overly excited, but from a coaching perspective he's the guy you always want on the ice in critical situations. He's your go-to guy and team leader and is just going to be consistent at the junior level and, eventually, the pro level." Reinhart has learned all about what the NHL draft is all about. He was there in 2010 when Max was taken by the Flames in the third round (No. 64), and in 2012 when the New York Islanders used the fourth pick on Griffin. "I've learned a lot [from watching]," Sam said. "It definitely makes for a longer year, that's for sure. Griffin, the way he handled it, he was in the spotlight a little more than Max was and they both handled it tremendously well. Griffin, just his personality, it doesn't bother him too much; never has, never will. He was more quiet about it. I think that's the approach you want to take. You have to embrace it, at times let it slide by you and not focus on it too much." That helpful brotherly advice has been a hallmark of the relationship between the three. "They get along famously," Paul Reinhart said. "They never actually came to fisticuffs. They had very few even arguments and fights. They obviously come across the odd one, but we're hard-pressed to remember any time that they really got into a tiff and certainly nothing that lasted long." Paul and his wife, Theresa, did have a secret weapon to quickly defuse any issues that would arise between the boys. "My wife recognized the best thing we could do is get a dog," Paul Reinhart said. "At which point when we got the dog [a Portuguese water dog named FloJo], what happened was, when one of them got so frustrated they'd take off with the dog. The dog's love was unequivocal." When the boys weren't playing with the family dog, they were taking part in some sport or another. Despite having such a strong hockey pedigree, Sam said neither he nor his brothers ever was pushed into hockey. Rather, they came to it organically and stayed because they liked it. "We all chose hockey at the end," he said. "We don't talk about hockey at home a lot of the time. Growing up, Max, it was a question if he wanted to golf for a long time or play hockey. We all played baseball, lacrosse for a few years, soccer. Even now Max and I are huge soccer fans. It hasn't been hockey the whole time and it certainly isn't right now. We play a lot of tennis in the offseason as well." But hockey is his passion, and it's shown on the ice. Now in his third full season with the Kootenay Ice of the Western Hockey League, he has five goals and 11 assists, and his 16 points has him tied for second in the league. 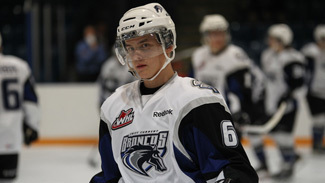 He also earned an "A" rating from Central Scouting in its preliminary list of players to watch from the WHL. Last season he led Kootenay in goals (35), assists (50) and points (85). He also was a plus-8 with nine power-play goals and two shorthanded goals while playing all 72 regular-season games. After Kootenay was eliminated in the first round of the WHL playoffs, he went on to captain Canada to the gold medal at the 2013 IIHF World Under-18 Championship, finishing with three goals and four assists in seven games. The U-18 gold was a nice bracket to the way he started the 2012-13 season -- he had three goals and five assists in eight games while captaining Canada to the gold medal at the Ivan Hlinka Memorial Tournament in August 2012. Reinhart was one of the youngest players on both teams, but playing, and excelling, against older players is nothing new for him. He was doing it again this summer as he was one of the youngest players to take part in Canada's summer national junior evaluation camp. He had a goal in each of the two exhibition games he played in, against Finland and the United States. He played on the wing rather than his natural center position, and also was used to kill penalties. "I know Sam is an 18-year-old player [but] he's a very good hockey player," Canada coach Brent Sutter said, "and I have no problem whatsoever putting him in all those key situations." Reinhart said he was OK with playing anywhere if it meant a trip to Malmo, Sweden in late December for 2014 IIHF World Junior Championship. "It's not the first time I've been moved over," he said. "Canada has so many centermen now so someone has to do it. Just have to get used to it, be comfortable with it [and] embrace it." He's also accepted what's going to come this season for him, as the spotlight will be on him right though the 2014 draft, which will be held June 27-28 in Philadelphia. "Maybe a little motivation," he said, "but it's not on my mind too much at all." He also said the chance to be the No. 1 pick, as well as the highest-drafted member of his family, isn't something he's focused on. "That would be a great honor, but it's a long way to go and a lot of hockey to be played," he said. "I'm going to take it one step at a time."